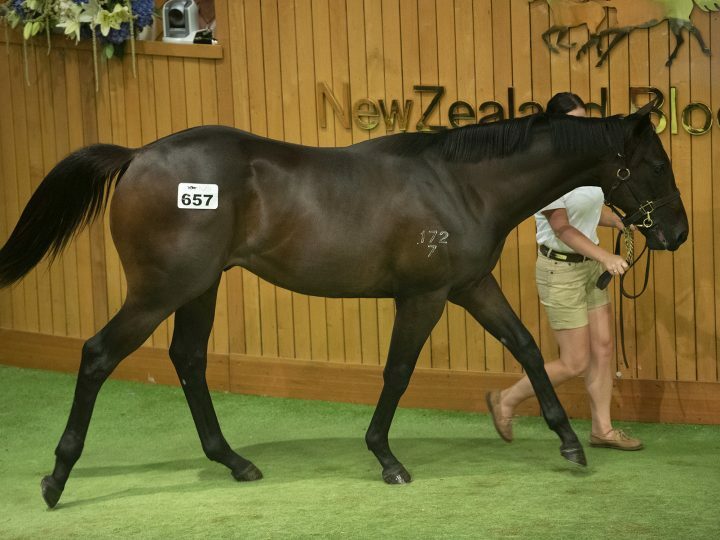 The ever-reliable Savabeel didn’t disappoint on the closing day of the Book 1 Sale at Karaka. A colt closely-related to Monday’s $1.4 million Savabeel sale-topper earned widespread attention this afternoon. Bidding was fierce before international agent Hubie de Burgh had the final say at $500,000. “He looks like a Cox Plate horse we hope. He’s really athletic and beautifully balanced, he floats on air. “He is by this great stallion Savabeel out of an O’Reilly mare and that’s a fantastic cross. “It’s a great all-up package and from a great stud that just keeps breeding Group 1 winners. “Hopefully, we are reducing our risk and he is very closely related to the horse that made NZ$1.4 million. We wanted to buy him, but didn’t have the budget. He is out of Cupid, a three-quarter sister to the stakes performer Patrick and a half-sister to the Gr.1 Queensland Oaks runner-up Another Dollar. The colt also presented a memorable result for Waikato Stud’s Bloodstock Manager Kerrie Cox, who is a part-owner. Savabeel’s son out of the unraced Anabaa mare Chilled Out (Lot 639) was also popular and was knocked down for $425,000. This colt’s dam, Chilled Out is a half-sister to the stakes winner The Big Chill and to the dam of Coldplay. She won six races, including the Gr.2 Rich Hill Mile and the Gr.2 Cal Isuzu Stakes. Another major result was Lot 661 who was knocked down for 340,000 to Nigel Tiley on behalf of the Balia Family Trust. She is out of the Pins mare Daisy Chain, a sister to the multiple winner and Listed performer Snowdrop. They are daughters of the multiple Group One winner and former champion three-year-old Daffodil. Major Australian players Aquis Farm also claimed a Savabeel colt for $375,000. He is out of the winning O’Reilly mare Chandelier (Lot 631), a sister to the Group Two and Three winner Irlanda. Successful agent Bruce Perry went to $300,000 for a Savabeel filly out of the O’Reilly mare Baby Shacks (Lot 579), who didn’t race but is particularly well-related. She is a sister to Group Two winners Vigor and Joey Massino and Karaka Million winner Vincent Mangano. Team Rogerson was understandably hot on the Pins colt out of Costume (Lot 654) and successfully pursued him with a final $280,000. They trained his dam to win the Gr.1 Spring Classic and the Gr.1 Herbie Dyke Stakes. Close relation Masque has also won for the stable and ran third in the Listed Wellesley Stakes. A son of Ocean Park was popular in the ring before he was knocked down to Queensland interests for $190,000. Offered as Lot (600), he is a half-brother to the Stakes winner Preditor and to Flamingo, a Group Three performer. Their dam is the Danasinga mare Bird, who won the Listed Warstep Stakes. It is the family of the Gr.1 Auckland Cup winner Chenille and the Gr.2 Rich Hill Mile winner Chintz. Waikato Stud has enjoyed yet another outstanding Book 1 sale at Karaka and is the champion vendor for the sixth consecutive year. They ended with an aggregate of $16,115,000 and at average of $226,971 to be the top vendor in both of those divisions.